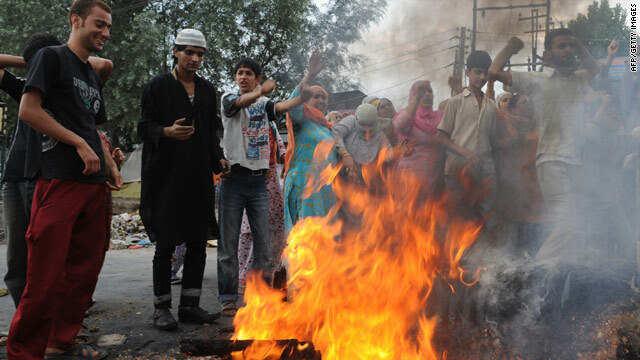 Protesters defy a curfew as they gather to set a fire alight during a demonstration in Srinagar. Srinagar, India (CNN) -- Spiraling violence claimed five more lives Tuesday in Indian-administered Kashmir, where anti-India mobs continued to defy the curfew restrictions in the capital of Srinagar and other towns. Authorities, however, succeeded Tuesday in clearing and restoring traffic on the strategic Srinagar Jammu national highway -- which connects the landlocked Kashmir Valley with rest of the country --by deploying Indian army troops and paramilitary forces. The highway had been blocked for four days as protesters squatted on it, disrupting traffic. The protesters in Kashmir are opposed to Indian rule and angry over recent alleged human rights violations in Muslim-majority Kashmir. A police spokesman in Srinagar said mobs defied curfew restrictions and threw rocks in Srinagar and other major towns. Indian police opened fire to quell the mobs, wounding four people, three of whom later died. A police spokesman said security forces were forced to fire as a last resort to control the protesters. The news of the three deaths triggered another wave of protests and violence with more people defying curfew restrictions in other areas of the capital. Thousands of people joined the funeral of 18-year old Anis Manzoor and carried his body through the narrow streets of the old city, chanting anti-India and pro-freedom slogans. Immediately after the burial, angry mobs broke up into various groups while returning from the graveyard. The police spokesman said mobs attacked and torched a police post, and the homes of two police officers in south Kashmir's Frisal. He said police fired in self-defense, killing one person in the village. Three others were injured. A young person who was injured during the violence on Sunday also died Tuesday. Since the violence escalated June 11, a total of 44 people have been killed -- 27 of them in the last five days.